When using Facebook Sharer, Facebook will offer the user the option of using 1 of a few images pulled from the source as a preview for their link. How are these images selected, and how can I ensure that any particular image on my page is always included in this list? How do I tell Facebook which image to use when my page gets shared? Facebook has a set of open-graph meta tags that it looks at to decide which image to show. and it should be present inside the <head></head> tag at the top of your page. If these tags are not present, it will look for their older method of specifying an image: <link rel="image_src" href="/myimage.jpg"/>. If neither are present, Facebook will look at the content of your page and choose images from your page that meet its share image criteria: Image must be at least 200px by 200px, have a maximum aspect ratio of 3:1, and in PNG, JPEG or GIF format. Can I specify multiple images to allow the user to select an image? I specified the appropriate image meta tags. Why isn't Facebook accepting the changes? Once a url has been shared, Facebook's crawler, which has a user agent of facebookexternalhit/1.1 (+https://www.facebook.com/externalhit_uatext.php), will access your page and cache the meta information. To force Facebook servers to clear the cache, use the Facebook Url Debugger / Linter Tool that they launched in June 2010 to refresh the cache and troubleshoot any meta tag issues on your page. Also, the images on the page must be publicly accessible to the Facebook crawler. You should specify absolute url's like http://example.com/yourimage.jpg instead of just /yourimage.jpg. Adding these tags causes my page to no longer validate. How can I fix this? Add the button as you should according to what FB tells you. It's plain simple: you do not need any js or other settings. Is just an HTML raw link. Style the A tag in any way you want to. As far as what it chooses as the default in the absence of this tag, I'm not sure. From my experience, the http://www.facebook.com/sharer.php does not use meta tags. It uses the string you pass. See below. 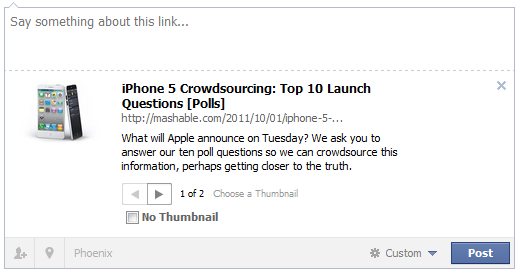 The meta tags work with Facebook's developer like/send buttons, as does the other Open Graph info. So if you use one of Facebook's actual elements like the comments and such, that will all tie into the Open Graph stuff. ~~> Will pull info from the string. It randomly worked off and on during the first day I implemented it, hasn't worked at all since. The Facebook linter page, a utility that inspects your page, reports that everything is correct and does display the thumbnail I selected... just that the share.php page itself doesn't seem to be functioning. Has to be a bug over at Facebook, one they apparently don't care to fix as every bug report regarding this issue I've seen in their system all say resolved or fixed. To change Title, Description and Image, we need to add some meta tags under head tag. Add your URL in text box (e.g http://www.test.com/) where you mentioned the tags. Click on DEBUG button. I had this problem and fixed it with manuel-84's suggestion. Using a 400x400px image worked great, while my smaller image never showed up in the sharer. This is what worked for me: I placed the desired thumbnail image on the page right after the tag and making it too small to see.. I have not tested it with height 0 and width 0 but it probably will still work.. This does not guarantee the user will select this image..
ALSO it seems like Facebook caches the thumbnails on your page and doesnt always check it for new ones.. try adding this to another page on your site and you'll see that it works. Basically, you're going to hard code an if statement into your site's HTML to get it to change the meta content for whatever you've changed for that one post. It's a messy solution, but it works. Not the answer you're looking for? Browse other questions tagged facebook opengraph facebook-sharer or ask your own question. Facebook sharer.php, how to have multiple og:image tags? Using Facebook's Open Graph protocol, are multiple thumbnail images allowed? What does og:image meta data do with the Facebook Like iframe? How to clear Facebook Sharer cache? How can I set a website image that will show as preview on Facebook?